In native pastures with a high density of perennial species and low clover composition, rotational grazing and fertiliser have limited influence on pasture composition if critical destocking benchmarks for ground cover (70% flat country and 80-90% on hill country) and herbage mass (800 kg DM/ha) are in place. Productivity of native pastures and the response to increased fertility is, in part, reliant on the presence of legumes and fertiliser-responsive annual grasses. At Chiltern EverGraze Proof Site, the pasture production response to higher fertiliser inputs (21 kg P/ha every year vs 11 kg P/ha every second year) was roughly equivalent to the consumption of additional ewes grazed in the higher fertiliser treatment (5 ewes/ha vs 3 ewes/ha). The resulting increase in per hectare lamb production was able to justify the investment in higher fertiliser inputs only after rates were dropped to maintenance levels after two years of capital investment (see lamb production message). During the short period of the experiment, and while thresholds for destocking based on ground cover (70%) and feed on offer (800 kg/ha) were in place, there were no pasture composition differences between grazing systems (simple 4-paddock versus set stocking) or stocking rate (low and high). In contrast to expectations, there was no increase in the annual grass or clover composition or decrease in native grass composition in response to phosphorus fertiliser inputs at Chiltern. This was most likely a result of the initial composition – high native grass (>60%), low clover (<3%) and lack of fertiliser-responsive annual species. 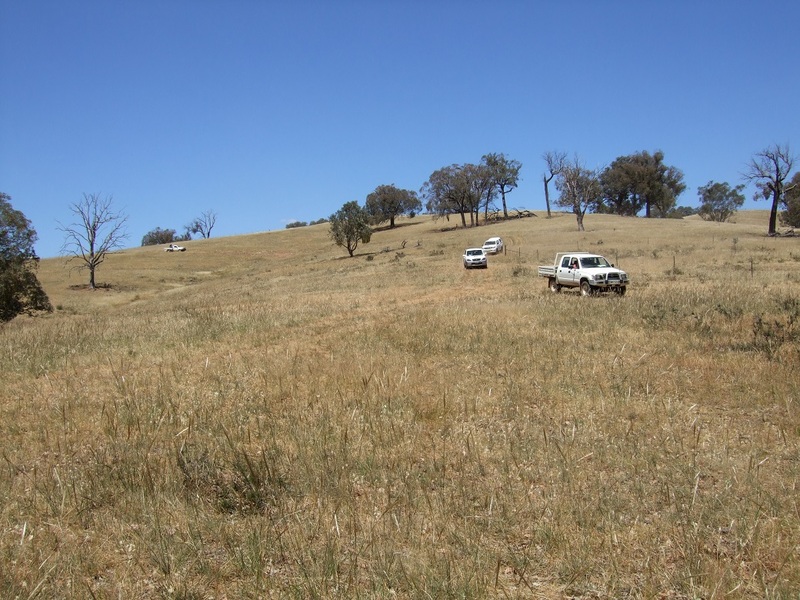 Early data analysis for a second site at Holbrook also indicated that there were no differences in pasture composition between native pastures which were set stocked compared to those that were strategically grazed in combination with phalaris pastures. This was also consistent with findings from the Orange Proof Site which showed no difference in pasture composition between 1-Paddock, 4-Paddock and 20-Paddock systems. Composition results at Tallangatta Valley, Murmungee and Warrak Supporting Sites were, for the most part, very consistent with findings at the Proof Sites. At all sites, pasture composition and production may have changed under the different management regimes if the experiments were run for longer and through a greater range of seasonal conditions. At Chiltern, average Microlaena basal cover (over all treatments) increased steadily from 7% (2008) to 28% (2011). This was most likely due to spread of existing plants in response to managing to herbage mass and ground cover benchmarks, and high summer rainfall in 2010. This finding was also consistent with the Orange Proof Site. Wallaby grass basal cover dramatically increased (from around 2% to 14%) in the fourth year, most likely due to recruitment of new plants in response to summer rainfall events in 2010 and 2011 and a reduced 2011-12 summer stocking rate. Broadcasting sub clover with superphosphate fertiliser did not result in any increase in clover percentage. This was consistent with results at Holbrook which showed that direct drilling clover was successful but broadcasting was not. The following video is a short interview with Meredith Mitchell who talks about the importance of improving native pastures on hill country and how to graze native pastures strategically. By definition, a native pasture is ‘any pasture where the main perennial species is a native grass’ (Crothwait and Malcolm 2001). After decades of widespread grazing in southern Australia, there have been considerable changes in native pasture composition. Many native species have declined and in some cases native species have disappeared altogether, while some introduced species (particularly annual species) have successfully increased. Native pastures are often described as the ‘unimproved’ areas of the farm. They generally offer poor returns, are predominately used for dry stock, and occupy a considerable proportion of the landscape of southern NSW and north-east Victoria. Low profitability from native pastures is a complex issue and may have as much to do with landscape and soil factors as with the pasture species themselves. Options for improved production include increased soil fertility, running higher value reproductive enterprises, and increasing pasture utilisation with improved grazing management. However, these options need to be balanced with the need to maintain the native perennial grass component, which is important for managing ground cover in areas often very prone to water erosion. Also, returns from investment in fertiliser, supplementary feed and infrastructure for grazing management, particularly of hill country pastures, is often questionable in these systems which have more marginal production responses and are inherently more difficult to access, work, fence and manage than lowland pastures. Virgona (2007) provides an extensive review of the dynamics of native pasture composition and production under different management regimes. The following is a summary of the key components which form the background to the EverGraze research. Fertiliser: Using superphosphate fertiliser to increase phosphorus (P) and sulphur (S) can change both the production and composition of native pastures, predominately due to increased legume growth and a resulting build-up of available nitrogen (N). Higher P and N are utilised more efficiently by introduced grasses, legumes and weeds (predominately annuals) than native grasses which have evolved under low P and N conditions. Where these species are of high nutritive value (eg. clover, annual ryegrass, barley grass, capeweed), this can lead to increased animal production and stocking rates, especially in winter and early spring. The higher pasture growth and quality may make it possible to run reproductive stock and at higher stocking rates than unfertilised native pastures. However, the disproportionate response of annual species to fertiliser often comes at the expense of the native component. Grazing management: Traditionally, native pastures have been set stocked with dry stock which are allowed to selectively graze the high quality annuals, only grazing native perennials when seasonal conditions tighten up. Mobbing up animals and implementing a rotation strategy enables greater control, allowing native pastures to be grazed and rested at strategic times and to allow sufficient recovery from grazing. This may influence composition changes and/or increase utilisation and resulting stocking rates (eg. Broadford Grazing Experiment, Ararat Steep Hills trial) but may also come at the expense of individual animal performance. The value of different grazing regimes is discussed in the EverGraze Exchange – the Nuts and Bolts of Grazing Strategies. Flexible stocking rates: Grazing methods for increasing utilisation and manipulating composition need to be combined with flexible stocking rates so that stock can be removed when ground cover reaches 70% on flat country and 80-90% on hill country (higher percentages for steeper country), and available herbage mass reaches 800 kg/ha. These benchmarks were developed by the Sustainable Grazing Systems project and put in place at all EverGraze sites to protect against water erosion and maintain persistence of perennial pastures. In forming recommendations for the use and management of native pastures, it is important to recognise that every farm is unique, and the existing soil characteristics and composition of native pastures will significantly influence the response to seasonal conditions and management. Management options will also be determined by the enterprise mix, landscape, infrastructure and other pastures on the farm. EverGraze research conducted at Chiltern (north-east Victoria), Holbrook (southern NSW) and Orange (Central Tablelands NSW) aimed to test a range of fertiliser, grazing management and livestock system combinations for improving returns from native pastures while maintaining or improving pasture composition. All sites ran high value reproductive meat/wool enterprises. At Orange, the focus was on fertilising only the most responsive ‘production zone’, and testing the value of rotational grazing for increasing utilisation and production in a variable landscape on moderate hill country. At Chiltern, the value of increasing soil fertility and stocking rates using high and low fertiliser inputs was combined with rotational grazing to maintain pasture composition and increase utilisation. At Holbrook, management of native pastures was integrated with management of phalaris/sub clover on another part of the farm. This page focusses predominately on pasture production and composition results from the Chiltern site and compares to the outcomes from Orange. Some data from Holbrook phalaris and native pasture persistence is also presented. Detailed pasture production and composition results from Orange can be found here. Livestock production and profitability outcomes from Holbrook and Chiltern are also available. The effectiveness of rotational grazing for maintaining persistence and composition of native pastures under low and high fertiliser rates. The three treatments are detailed in Table 1. The systems were run on 3 ha paddocks and were grazed using a breeding flock of Merino (Centre Plus) ewes joined to terminal (Dorset) sires. *High fertility simple rotation 250 kg/ha (21 kg P/ha) single super-phosphate annually High Simple four paddock rotation (two weeks grazing followed by six weeks rest). *A fourth treatment which was exactly the same as the high fertility simple rotation, with the exception of set stocking used for lambing, was also included but did not present any significantly different results, and has therefore been excluded here. Sheep were taken off the plots if pasture mass and or cover fell below the critical limits (800 kg DM/ha and/or 70% groundcover respectively). Stocking rates were re-assessed each winter and varied between years depending on available herbage mass at that time. There was a high degree of seasonal variability throughout the experiment, and so stock were removed for extended periods during the dry years of 2008 and 2009, while in 2010-2012, plots were under-utilised due to exceptionally good seasonal conditions. An attempt was made to reintroduce clover into the site by broadcasting with fertiliser in 2008. 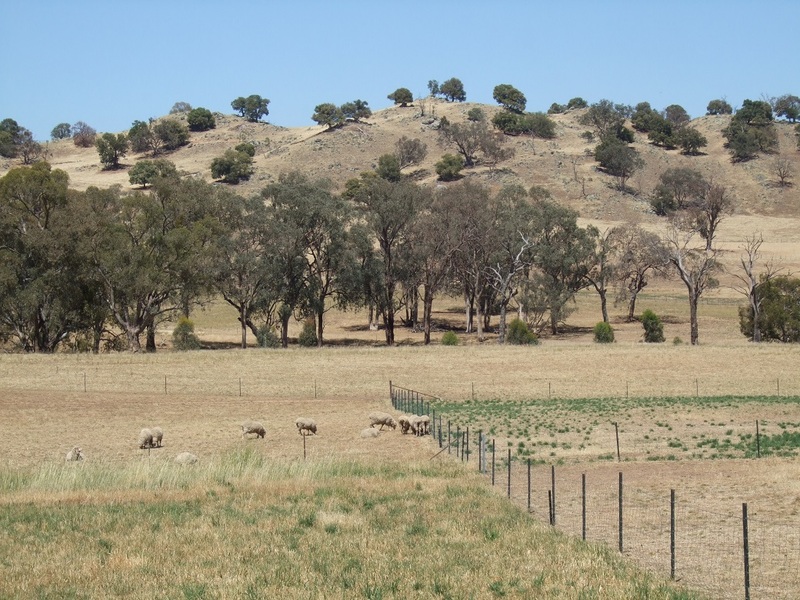 The rationale behind the Holbrook experiment was to demonstrate that where improved pastures on undulating country and native pastures on hill country existed on the same farm, “integrated” grazing was possible. 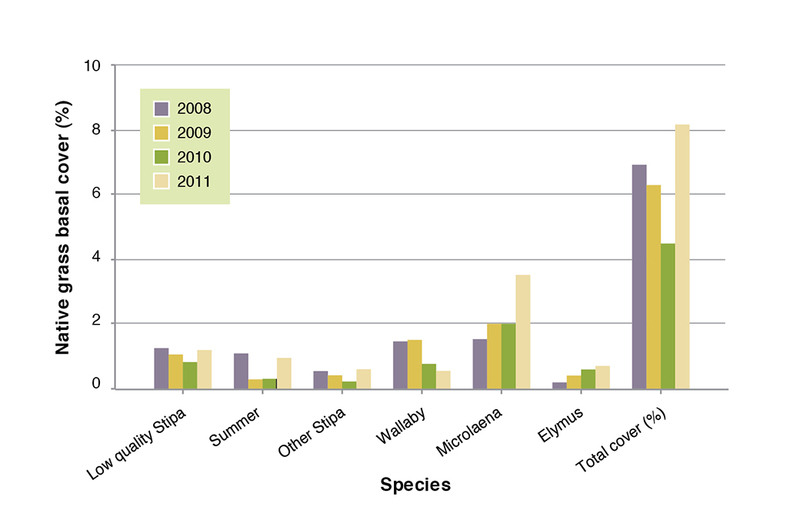 Two grazing systems were evaluated from 2008-2011 and are represented in Figure 1. 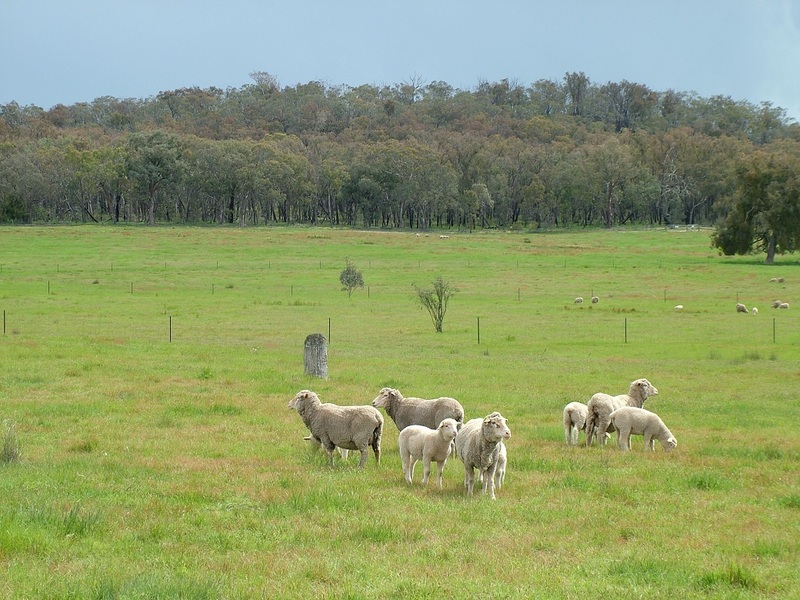 The traditional approach (Separate treatment) of placing higher value breeding stock on improved pastures (phalaris, cocksfoot, sub clover) with lower value dry stock (wethers) on native country was compared against a single breeding flock that grazed across both pasture types (Integrated). In a third treatment (run from 2009-2011), the Integrated system was run with no fertiliser inputs on native pastures. Merino ewes (Centre-plus) joined to terminal sires were used in both systems with Merino wethers also being used in the Separate treatment. 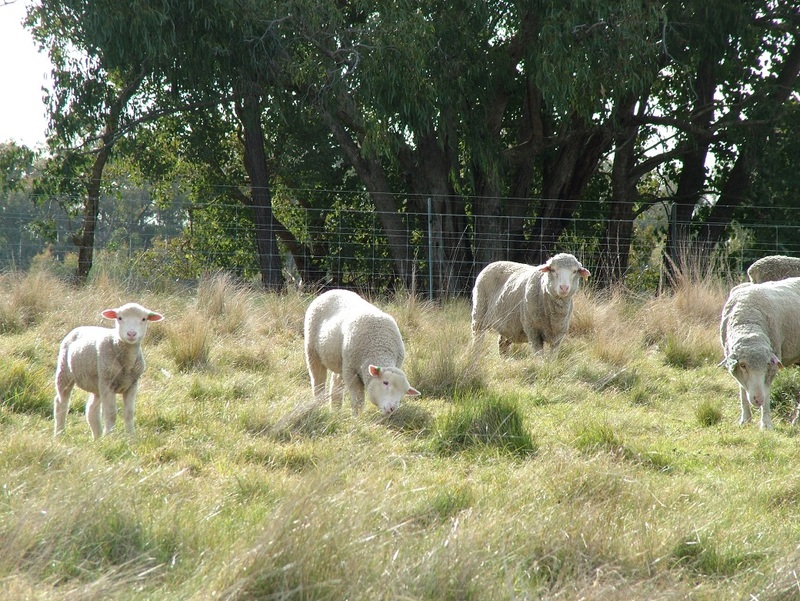 It was expected that in the integrated system, utilising the native pastures with reproductive stock would be more profitable than including wethers in the system; nutritional needs of the stock could be met throughout the growing season; and high spring stocking rates and mob sizes could be utilised to manage spring production from annual species in native pastures at higher fertility. Figure 1. Grazing treatments at Holbrook EverGraze Proof Site. A single mob grazed on a 4-Paddock phalaris/cocksfoot/sub clover rotation and 2-paddock of native pasture. 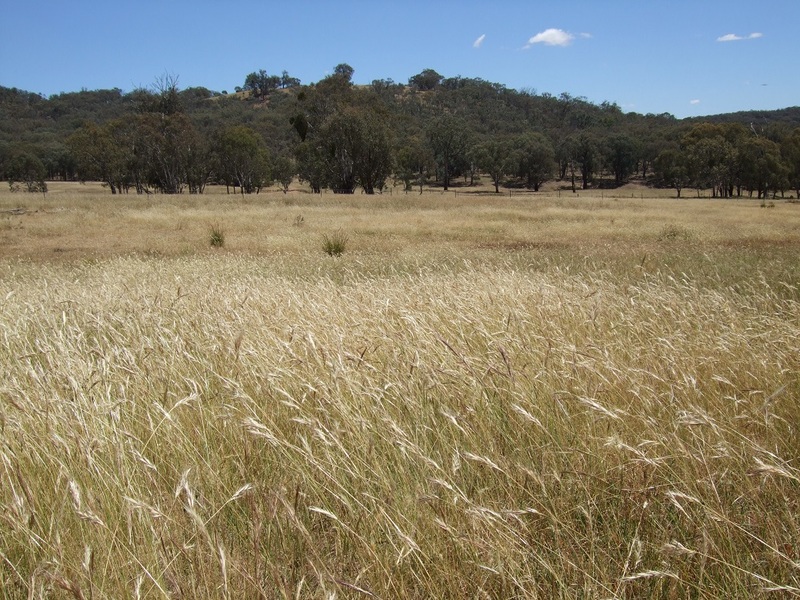 The native pasture at Holbrook had a diverse range of native grasses including spear (Austrostipa spp. ), wallaby, Microlaena, red (Bothriochloa macra) and common wheat grasses (Elymus scaber) with annual species such as sub clover, vulpia, barley grass, Paterson’s curse and capeweed. The Chiltern site started with low phosphorus levels (Olsen P = 6 mg/kg). At the low single super phosphate application rate (125 kg/ha every 2 years), Olsen P was maintained at this level. At the high single super phosphate rate (250 kg/ha/year), Olsen P was lifted to 12 mg/kg and maintained at this level, even though in theory, this would be approximately double the required maintenance rate. The soil buffering index was 90 (moderate). It is not known why levels did not further increase. The rainfall was variable over the experimental period (Figure 2c). Rainfall for 2008, 2009 and the start of 2010 were below median (682 mm), whereas rainfall for 2011 was above average, with 276 mm received in February 2011. Seasonal conditions had the greatest influence on herbage mass throughout the experiment. Stock were removed for a large proportion of 2008 and 2009 due to poor seasonal conditions, and then the plots were under-utilised in 2010-12 due to exceptionally good seasonal conditions. There were no significant differences in herbage mass between grazing or fertiliser treatments. Given that the high fertiliser treatment carried a higher stocking rate, the pasture production response to fertiliser was approximately equivalent to the consumption of the additional stock carried in the high fertiliser treatment. The lack of fertiliser-responsive annual grasses (eg. 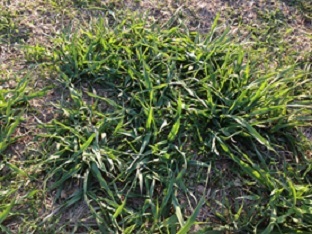 perennial ryegrass, barley grass, capeweed) and clovers is likely to have limited this response. Figure 2. (a) Average herbage mass; (b) stocking rate; (c) actual monthly rainfall (solid green bars) and monthly average rainfall (line) at Chiltern. c) Over-riding effects of seasonal conditions during the short period of the experiment. The major species found at the site (representing >5% of the herbage mass) were weeping grass (Microlaena stipoides), sweet vernal grass (Anthoxanthum odoratum), wallaby grass (Rytidosperma spp., previously Austrodanthonia spp. ), spear grass (Austrostipa spp. ), pigeon grass (Setaria pumila), silver grass (Vulpia myuros), onion grass (Romulea rosea) and Yorkshire fog grass (Holcus lanatus). Legumes made up 0-1.5% of pasture composition throughout the experiment. 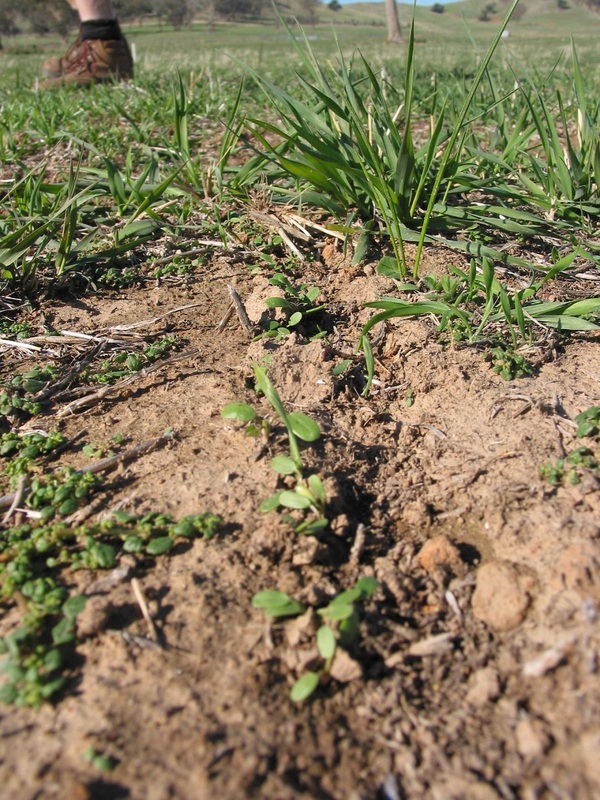 The lack of clover was likely due to poor spring rainfall over a number of years that prevented seed-set, and also low soil pH. Sub clover seed was broadcast in 2008 and this was not successful in achieving any significant increase in clover composition. 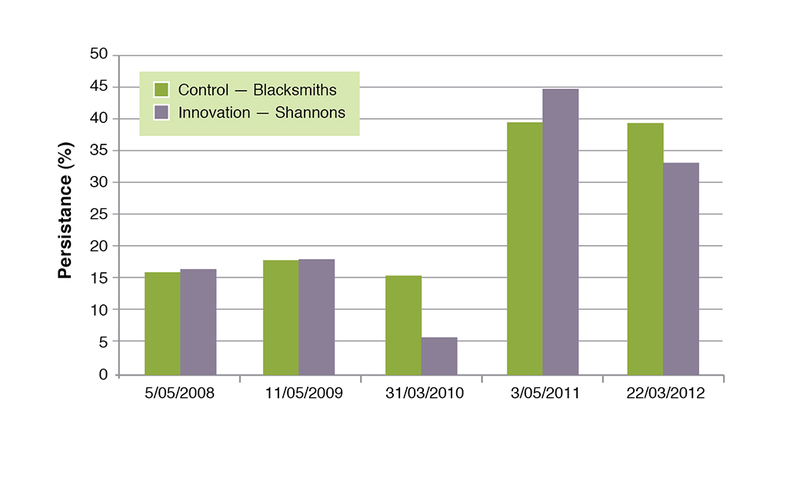 This result was consistent with trial work conducted at the Holbrook site which compared sowing methods of sub clover. Establishment was only successful where sub clover was direct drilled. Clover germination at Holbrook in the direct drilled treatment. Low legume content and fertiliser-responsive annual species at Chiltern meant there was no composition or production change in response to increased fertility. The composition of the pasture followed the seasonal trends, with the annual species dominating during the winter months and the native perennial species dominating during the summer months (Figure 3). Figure 3. Species composition averaged across all treatments during the experimental period at Chiltern (there were no significant differences between treatments). There were significant differences in the basal cover (the percentage of ground occupied by crowns) of both Microlaena and wallaby grass between years of the experiment but not between grazing or fertiliser treatments (Figure 4). 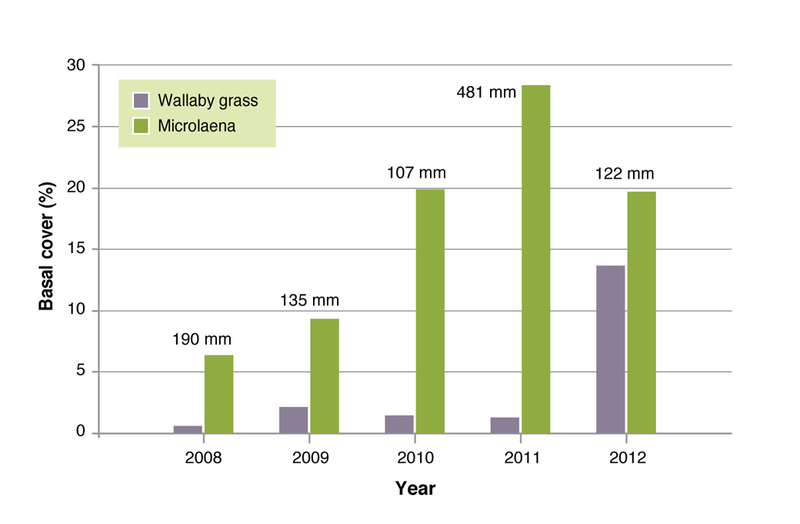 The basal cover of wallaby grass increased dramatically in the final year, reaching 14% (from 1%) in 2012. The basal cover of Microlaena reached a peak of 28% (from 6%) in 2011. The difference in pattern of increase between Microlaena and Wallaby grass can be explained by the physiology of the two species, together with season and management (click here for physiological traits of different species). Microlaena spreads vegetatively by stolons, rhizomes and tillers. It was therefore able to respond quickly to summer rainfall. 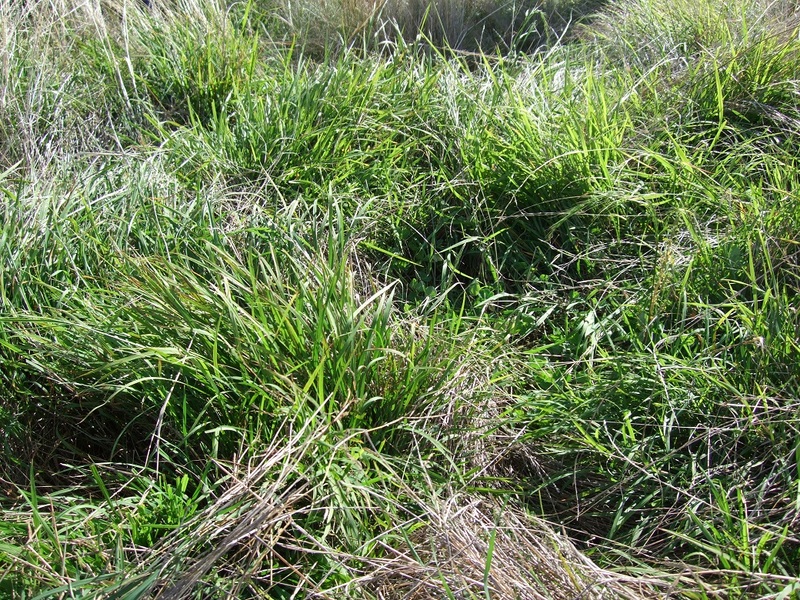 Wallaby grass can only spread by tillering and recruiting new seedlings. 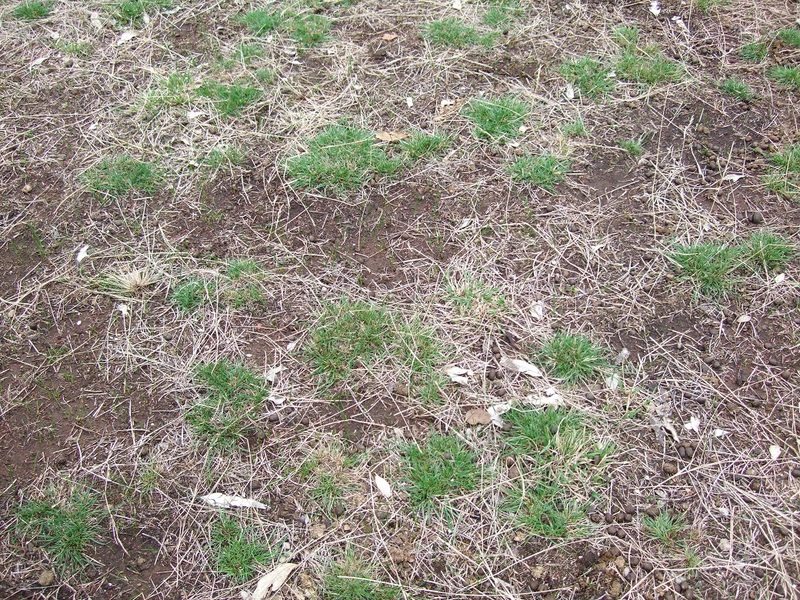 The summer rainfall events of 2010/2011 provided opportunity for recruitment of wallaby grass, however these seedlings would have been too small to have been counted in the basal measurements collected at the end of summer. After the ewes were removed from the site in November 2011, the wallaby grass seedlings would have grown, enabling them to be counted in the late summer 2012. The basal cover results in response to seasonal conditions experienced at Chiltern are consistent with those experienced at the Orange EverGraze Proof Site. Figure 4. Basal cover (%) for weeping grass and wallaby grass, annually for the period of the experiment, with summer (December, January and February) rainfall (mm). Microlaena can spread rapidly by tillers, stolons and rhizomes in response to summer rainfall. Wallaby grass relies on seed-set and germination to reproduce so seed-set in spring and open spaces in Autumn are important when seasonal conditions are favorable. The two grazing regimes did not affect composition or ground cover of the native pastures at Holbrook. This is most likely due to the over-riding effect of season, together with management to ground cover (80%) and herbage mass (800 kg/ha) benchmarks which prevented loss of native species under set stocked conditions. In line with the Chiltern results, Microlaena increased significantly after the summer rainfall events of 2010/11 (Figure 5). Measurements were not taken in 2012, so it’s not known whether recruitment of wallaby grass occurred. Figure 5. Basal cover of the species in the native pasture system. “Total cover” refers to perennial grass basal cover. On the improved phalaris and cocksfoot pastures at Holbrook, basal cover of both species declined sharply during the drought (Figure 6). Phalaris, which spreads vegetatively by rhizomes and tillering, responded quickly to the high rainfall in 2010/2011. The cocksfoot, which spreads by tillering and seedling recruitment, was not able to respond. There were no differences between the grazing treatments. Herbage mass data is still being collated for this site and will be presented here soon. Phalaris and cocksfoot basal cover declined during the dry years of 2008-2009 and increased sharply after high spring/summer rains in 2010. Phalaris spreads by tillering and rhizomes which are evident in early autumn growth. Simultaneous to the Proof Site research, producers implemented grazing strategies at several EverGraze Supporting Sites (on-farm demonstrations) with the goal of improving profit while maintaining or increasing ground cover and perenniality of native pastures. Results from some of these sites are presented on each Supporting Site page, and are summarised below. 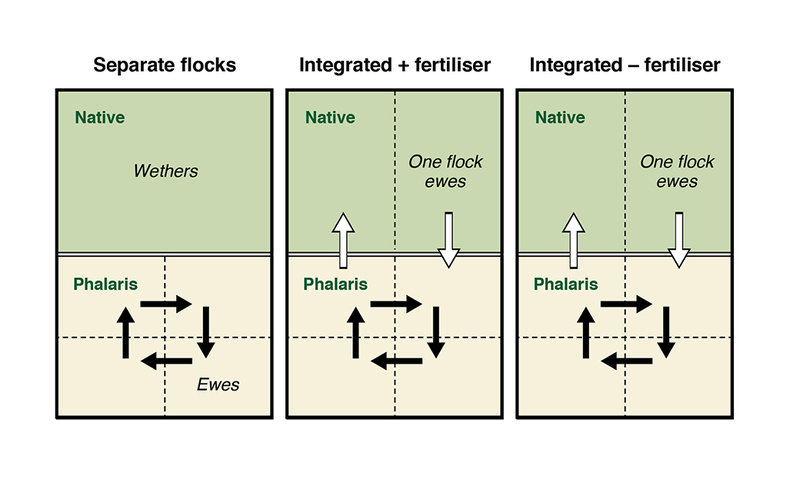 In addition to the Supporting Sites, EverGraze also published a number of case studies from the region such as Chris Mirams and Ian Locke at Holbrook, who tell their stories of how management of native pastures can be integrated into their systems. At Murmungee (730 mm) in northeast Victoria, Judy and Chris Griffiths compared set stocking (with cattle) with deferred and rotational grazing on a fertilised Microlaena-based native pasture. The presence of annual ryegrass (10-20%) and sub clover (20%) in this pasture meant that it was responsive to phosphorus fertiliser. Maintenance fertiliser inputs (7-10 kg P/ha/year) were applied throughout the demonstration and maintained Olsen P at 7-8 mg/kg. Microlaena made up 20-40% of pasture composition. The main undesirable species included silver grass (10-20%), onion grass (5-20%), sorrel (5-10%) and fog grass. Over the four and a half years of the demonstration (2008-2012), the site carried on average 11.1 DSE/ha in the rotation and 10.1 DSE/ha in the control. There was no treatment difference in Microlaena persistence or composition, but the rapid spread of Microlaena following high summer rainfall of 2010-11 was consistent with observations at Chiltern, Orange and Holbrook (Figure 7). At the beginning of the demonstration (spring 2007), the rotationally grazed treatment was grazed heavily to remove silver grass biomass before being shut up to allow Microlaena to seed throughout summer and to the autumn break (May). The Microlaena did run to seed four times that summer which received normal summer rainfall. The intention was to increase the Microlaena content of the pasture. Although the Microlaena flowered four times during this period of normal summer rainfall, there was no increase in the proportion of Microlaena compared to the control (which maintained >70% ground cover and >800 kg/ha at all times). The deferment resulted in an annual stocking rate of 5 DSE/ha compared to 10 DSE/ha on the control, equating to approximately $77/ha (at 40 c/DSE/week) agistment costs. Consistent with Proof Site findings, the message from this experience is that Microlaena has the capacity to spread rapidly in favorable conditions regardless of grazing method, provided ground cover and herbage mass are maintained above the critical benchmarks. At Warrak near Ararat in south-west Victoria (600 mm), Mark McKew implemented ‘optimised deferred grazing’ (heavy grazing of annual grasses in spring and resting through summer) combined with rotational grazing and compared to set stocking on a newly sub-divided, unfertilised native pasture. Chemical control was also used to manage onion grass at the site. From 2007-2010, stocking rate varied from 2.5-5 DSE/ha. The set stocked treatment carried more than the rotationally grazed treatment, but accumulated herbage mass in the rotationally grazed treatment indicated that stocking rate could be increased above that of the set stocked treatment. Native perennial grass density increased to 50% above the set stocked treatment although it is unclear as to whether this is a result of the lower stock pressure, or the rotational grazing. At Tallangatta Valley in north-east Victoria, Stuart and Janet Morant subdivided a native pasture into three paddocks including two steep hill country native pasture paddocks and an undulating paddock which they sowed to tall fescue, cocksfoot and sub clover. The paddock sub-division showed clear benefits with stocking rates on the sown area averaging 28 DSE/ha and estimated payback on the pasture renovation seven years (although management of the mixed pasture was not ideal). One of the hill paddocks was set stocked while the second was rotationally grazed in combination with the improved pasture (similar to the Holbrook Proof Site setup). The higher feed quality on the improved pasture meant that the rotationally grazed native pasture was not as well utilised as the set stocked native pasture. The resulting stocking rate was 7 DSE/ha on the rotationally grazed pasture compared to 11 DSE/ha on the set stocked pasture. There was no difference in the persistence of native perennials on either site, although the large boost in Microlaena basal cover following summer rains of 2010-11 was consistent with the Proof Site findings. Results from Chiltern, Holbrook and Orange, together with previous research and on-farm experience, indicates that response of pastures (species composition and production) to fertiliser, management and seasonal conditions is highly dependent on existing species composition, usually derived from soil type, moisture retention and soil fertility. The variability in slope and aspect across a site will also determine the value of implementing different grazing strategies for increasing pasture utilisation and stocking rate. The Orange EverGraze Proof Site demonstrated how these characteristics can be identified and managed according to production zones. The Dividing up the Farm for Grazing Management EverGraze Action also provides a process for mapping the farm. The first step is to identify the species in your pasture. A poster and EverGraze fact sheets on native pasture identification are available for Victoria and the Bundarra and Eastern Namoi regions of NSW. It’s also a good idea to do soil tests on the different areas of your farm to determine the potential to respond to increased soil fertility. Phosphorus fertiliser will have minimal impact on species composition if there is minimal existing legume or fertiliser-responsive annual species in the pasture. Sub clover cannot be introduced to a pasture by broadcasting with fertiliser and therefore needs to be direct drilled. The cost of doing this needs to be weighed up with the potential returns. Mobbing up animals and rotating around more paddocks will increase utilisation, especially in variable landscapes. Where there are high quality species such as annual ryegrass in the pasture, overall pasture production can also increase by allowing these species sufficient rest for recovery (rather than being selectively grazed). The overall result is increased stocking rate such as what was seen at Orange Proof Site, or on phalaris in the Broadford Grazing Experiment. However, the Chiltern experiment demonstrated that on less variable landscapes and with lower quality pastures, the production benefit from rotational grazing is low and may not return the investment (see Lamb production from native pastures at Chiltern Proof Site). Although there has been much evidence of the benefits of rotational grazing for maintaining and enhancing perennial grasses in sown pastures (eg. 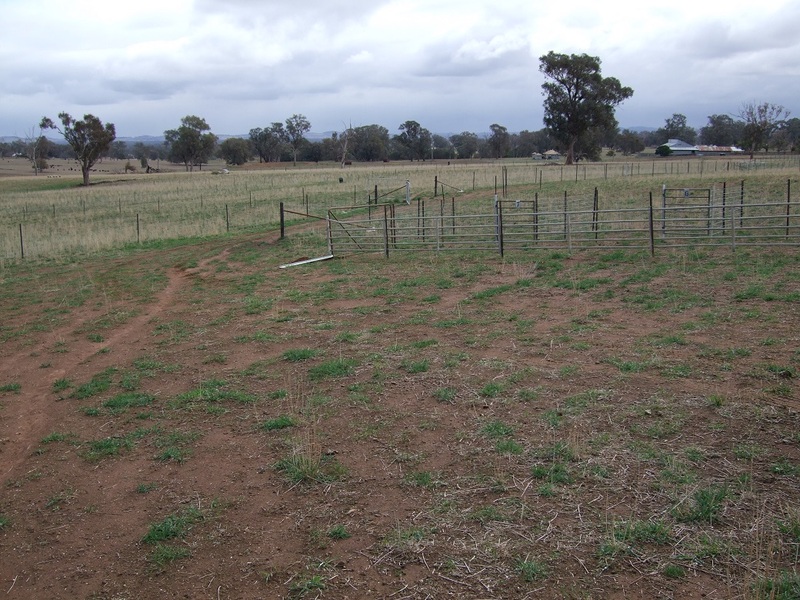 Broadford Grazing Experiment), the EverGraze research from Chiltern, Holbrook and Orange would indicate that pastures with a high proportion of native grasses may be less prone to change provided they are managed to ground cover and herbage mass benchmarks. The AWI FOO library and EverGraze Feed Budget and Rotation Planner are helpful tools for monitoring, planning ahead with seasonal fodder budgets and setting appropriate stocking rates for managing to pasture benchmarks. EverGraze also has a FOO gallery for native pastures. It is necessary to have designated sacrifice paddocks or stock containment areas for when these benchmarks are reached. All three sites showed that native grass density can significantly increase in response to high spring and summer rainfall, provided sufficient plant numbers are maintained through the dry periods (by managing to ground cover and herbage mass benchmarks). Required management to maximise plant density increase in high rainfall years depends on the reproductive physiology of each species. Microlaena has very low seedling recruitment but is responsive to summer rainfall and can spread vegetatively through rhizomes and stolons. Therefore, removing grazing pressure after summer rainfall events may provide the best chance of recovery. Wallaby grass requires seed set and germination so grazing pressure should be removed towards the end of spring to allow seed set, but pastures need to be well utilised through summer to provide enough space for germination the following autumn (if seasonal conditions are favourable). In good seasons it is usually possible to remove grazing pressure from these areas in late spring when there is an abundance of feed. Pastures that have a lower perennial density are likely to be less stable and more prone to shifts in composition caused by seasonal conditions and management. In these pastures, heavy grazing of undesirable annual grasses such as silver grass (Vulpia spp) in early-mid spring to reduce biomass production and seed set, and then resting to allow later flowering native grasses such as Microlaena and wallaby grass to increase biomass and set seed, has been shown to be effective (see EverGraze Action – Managing native pastures in Victoria for details of this technique). 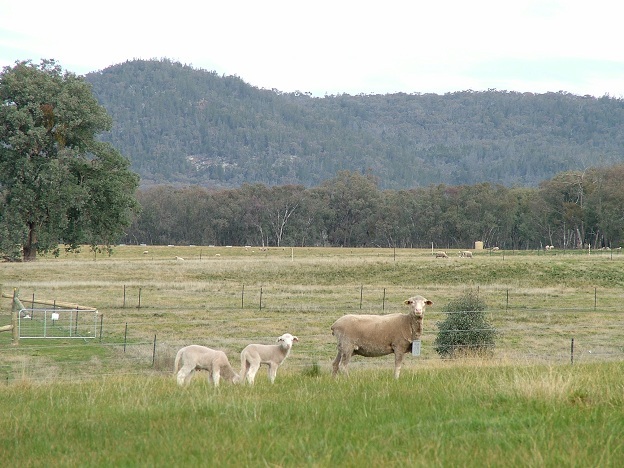 Running a single reproductive flock across native and improved pastures provides greater opportunity for utilising additional spring growth from the annual component of native pastures compared to running separate flocks of ewes and wethers. Although there was no measured benefit of this to composition at Holbrook during the life of the experiment, there were significant profitability benefits. The Orange and Chiltern experiments also demonstrated that reproductive flocks could be run profitably on native pastures. These production outcomes are discussed for Chiltern, Holbrook and Orange here. As long as we are careful to look after the native pasture species, they will be resilient and have the capacity to respond when conditions improve. The culmination of research and on-farm experience has informed a set of grazing management principles, and these are listed in the Nuts and Bolts of Grazing Strategies EverGraze Exchange. However, the application of these principles to maximise profit and manage the persistence of pastures will be different for every farm according to unique combinations of pasture species, soil fertility, landscape and management style. Therefore, identification of pasture species and production zones, as well as a set of management objectives, is critical to success. EverGraze is a Future Farm Industries CRC research and delivery partnership. The Chiltern EverGraze Proof Site was led by Meredith Mitchell, supported by a team of scientists and technical officers at the Agriculture Victoria, Rutherglen. Research at the Holbrook Proof site was lead by Jim Virgona, supported by technical officer Shane Hildebrand, Charles Sturt University, Wagga Wagga. An enthusiastic Regional Advisory Group consisting of farmers, consultants, extension officers and CMA staff provided significant input in to the direction, management practices and interpretation of outcomes from the experiments and modelling to make them relevant to farmers. Bolger TP, Garden DL (1999) Nutrient responses of wallaby grass (Danthonia spp.) from New South Wales tablelands. In ‘People and rangelands – building the future: Proceedings of the VIth International Rangeland Congress’. (Eds DJ Eldridge, D Freudenberger) pp. 269-271. (International Rangeland Society: Townsville). Lodge GM (1979) Effects of fertility levels on the yield of some native perennial grasses on the North-West slopes, New South Wales. Australian Rangeland Journal 1(4), 327-333. McIvor JG (2001) Pasture management in semi-arid tropical woodlands: regeneration of degraded pastures protected from grazing. Australian Journal of Experimental Agriculture 41, 487-496. Nie ZN, Zollinger RP, Jacobs JL (2009) Performance of 7 Australian native grasses from the temperate zone under a range of cutting and fertiliser regimes. Crop and Pasture Science 60, 943-953.